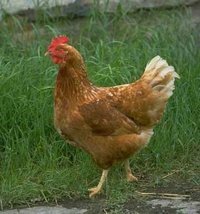 Hy-line point of lay pullets, these are hybrid hens, similar to isa brown hens, very good egg layers, good all round hens, very docile hens with a temperment ideal for children, perfect for your back garden, approximately 18 weeks old, available now, only £10.00 each!! Sorry, no other breeds available. Based in central Scotland, delivery available to most areas of Scotland for a small charge. I also supply LAYERS PELLETS (20 kg bag). As pullets are fed on the layers pellets that I sell, buying from me ensures continuity in the pullets' diet. EGG BOXES, GRIT, FEEDERS AND DRINKERS AND POULTRY BEDDING also available , call for prices and further information .